At Friday's press briefing, NASA scientists studying Pluto appeared to be giddy. What they once knew as only a yellowish blob is coming to life as a complex and fascinating world. NASA unveiled more discoveries about Pluto from the data that's begun trickling back after this week's historic fly-by. Scientists who've waited their whole careers for a glimpse of that faraway dwarf planet say they had no idea how complex it would be. "I'm a little biased, but I think the solar system saved the best for last," said Alan Stern, New Horizon's principal investigator, during Friday a press briefing. Based at NASA Ames in the Bay Area, geologist Jeff Moore has been picking apart the new images. "I'm still having to remind myself to take deep breaths. I mean the landscape is just astoundingly amazing," Moore said. "We've discovered vast craterless plains with some strange story to tell." The plains stand in stark contrast to icy mountains the size of the Rockies discovered earlier in the week. The lack of craters means they're young, formed either by movement beneath Pluto's surface, or by erosion. "Creating kind of the same sorts of patterns you see when you look at the surface of a boiling pot of oatmeal, or like the blobs in a lava lamp," Moore added. As the New Horizons spacecraft drifts farther from Pluto, it's looking back at it to measure its atmosphere. 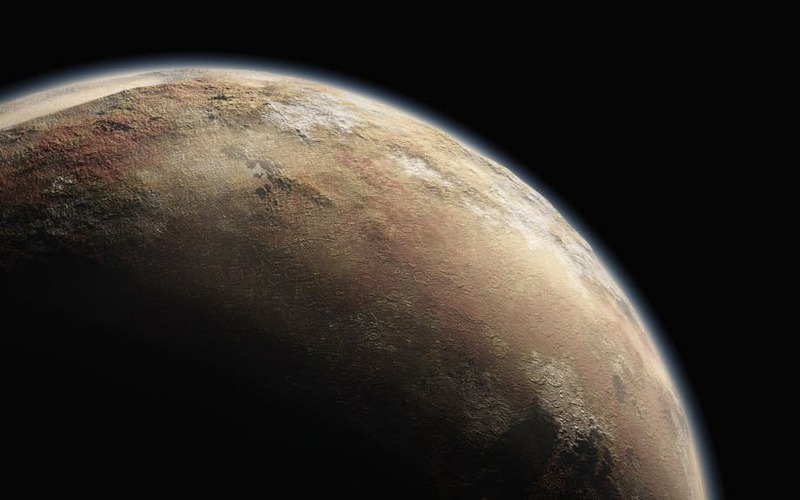 Scientists say the atmosphere is escaping from the dwarf planet's weak gravity. 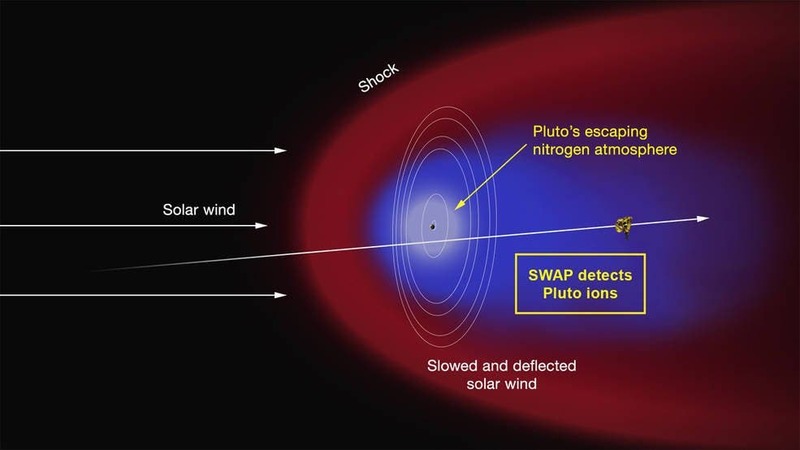 "And so what we see behind Pluto is a tail, an ion tail of this ionized escaping atmosphere that's being pulled away, carried away in the solar wind," said Fran Bagenal, New Horizons' co-investigator. NASA and the team behind its New Horizons spacecraft announced today that Pluto — the dwarf planet — has a giant tail that's part of Pluto's atmosphere., a frigid cloud of ionized gases trailing an estimated 48,000 to 68,000 miles behind Pluto, bits of atmosphere are being stripped away by solar wind, a torrent of electrically charged particles that constantly pours out of the sun in all directions. "We have actually flown through this [tail]," Fran Bagenal, a New Horizons coinvestigator from the University of Colorado at Boulder, said during the press conference. As far as we know, plasma is the most common state of matter in the universe. There's simply a lot of energy pouring out of stars, and a lot of gas in space to form plasma. So while it might seem surprising, plasma tails like Pluto's aren't new. They even exist behind other planets in the solar system, including Venus and Mars. NASA is anxiously waiting for New Horizons to beam back more data. By August the team hopes to calculate how fast Pluto is losing its atmosphere to space — and how quickly the icy world is shrinking. They've discovered wind currents near the surface are mild, around 10 miles an hour, and they'll learn more as the data pours in. "And we're really looking forward to getting that data in a moth or two, but it's really tantalizing right now and we're able to do science with it," Moore said. In fact, what scientists have now is merely a preview of what's to come. "We currently have on the ground less than one of those 50 gigabits," Stern said. It's been enough to incite the public's imagination. Pluto is social media's newest star. "I think Pluto's becoming a brand. It sort of sells itself and we don't really have to work all that hard," Stern said. There is lots of hard work to do as that data trickles in. They hope to learn more about what the ice on Pluto's surface is made of and just how cold it really is. It's been estimated at negative 369 degrees Fahrenheit.